at practice in Mankato, MN. Today on Vikings Corner we are going to take a look at days ten and eleven of our “Training Camp Chronicles” series. The Vikings had a light walkthrough, along with a practice on Sunday that were both moved to Myers Fieldhouse due to rainy conditions. 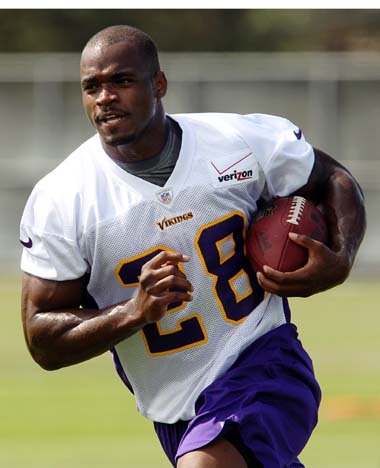 Today the Vikings got back out and the field and all eyes were on recently activated running back Adrian Peterson. During the morning walkthrough Peterson got reintroduced to the main cast of the offense and went through the plays at true walkthrough pace. In the afternoon, Peterson was not allowed to practice in full pads, due to CBA policy. He however was able to work in some position group drills. Peterson told the media that he would not wear a brace during the season, but many questioned if he would be allowed to do so. When Peterson took the field for the afternoon practice, he was without a brace. I think this is a huge mistake due to the risk that is applied to not wearing a brace for support. If his knee were hit in the right position without protection, the same injury could occur. His odds of being injured with a brace are considerably less than without. Only time will tell if this was a poor decision by the Vikings organization. The Vikings announced today that Harrison Smith will likely get the start on Friday versus the Buffalo Bills. He will likely start beside Jamarca Sanford and Mistral Raymond will be demoted to a backup. Smith made an impression in today’s afternoon practice, as he recorded a sack in a move the ball drill. He is just like having a linebacker in the backside of the defense, which is going to add a nice physical presence to our secondary. It will be interesting to see how Smith responds in his first action as a starter on Friday night. Coach Frazier also announced after the afternoon practice that Everson Griffen will be moved back to defense end. Many of us were wondering if Griffen even set foot on the field during the San Francisco game. You take a look back at the film and Griffen looked very uncomfortable and looked slightly oversized to be a linebacker. It didn’t help that backup defensive end Nick Reed looked lost on the field during the Colin Kapernick 78-yard touchdown run. Griffen will be a reliable backup at the defensive end position and I would like see him substituted more often along the defensive line. Matt Kalil got his wrist jammed into a pair of shoulder pads today and he was escorted to the training room for an MRI, which came back negative. He later jogged back on the field and resumed in full participation. There seemed to be little concern of the injury after practice was over, so things seem to be fine. Robert Blanton and Josh Robinson both resumed practice after both players struggled with sore hamstrings. They both were charted in with the threes and resumed full participation today. Blanton participated in his first action in almost two weeks, which is a positive sign for his comeback. I look forward to seeing what Blanton and Robinson can bring to the defense in their first action on Friday. Tight end John Carlson will miss another week of practice with an MCL sprain and Coach Frazier hopes to have Carlson involved in a game situation in the final preseason at Houston on August 30th. Coach Frazier also announced that there may be a possible competition between Marvin Mitchell and Erin Henderson at middle linebacker. Frazier explained, “I don't know if he's pushing (Henderson) for the starting job, but he's giving us some depth that we didn't have prior to signing him, as you know. But we'll see. We'll see how (Mitchell) performs in these preseason games. Erin still has to perform well. You don't want to say things are locked up where we are right now. We need competition." I like this mentality because it makes everyone compete at all times during the season. I like Mitchell’s presence on the roster and I feel like he can make a contribution, but time will tell if he outperforms Henderson in the middle of the defense. Overall, the Vikings are making a push to narrow down the depth chart in preparation for the preseason games over the next two weeks. We will truly be able to catch a glimpse of the positional charts as the preseason progresses. The Vikings have two practices remaining in Mankato and will report back to Winter Park for full-squad practices beginning on Thursday morning. We will keep you posted with the latest information during the remaining days or training camp.